So we bade farewell to the land of eternal spring and said “hello” to Honduras, and San Pedro Sula in particular. Google San Pedro Sula and the first thing you will learn is that it is the murder capital of the world – “but that doesn’t go on much now“ advised the delightful Honduran lady we met at the Air Canada lounge in L.A. I requested my travel insurance cover be raised. First impressions after a very short but early flight from Guatemala city was that San Pedro wasn’t that big, and seemed surrounded by pineapples. 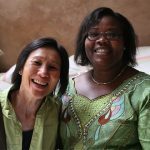 The International Airport was small, and customs was remarkably quick and friendly – maybe they were just glad someone was visiting. The second impression of Honduras is that even in the second largest city in Honduras, only the main roads (of which there seemed only three, and on which all San Pedro Sulans were travelling that day) are paved, which once we had made just a slight deviation to bypass the one third of all Hondurans on our road made for a bumpy journey through the outskirts. What is resoundingly obvious is that Honduras is one of the very poor countries in the region. The taxi driver in Tegucigalpa on our way out joked that Honduras is a rich country, it is just that the Presidents family has all the money, either way, the country is struggling – the employment and money that came from the clothing factories has now gone to a country who will do it cheaper, replaced by unemployment and drug trafficking. The gangs, whilst not as obvious have become more organised, which has made the streets safer, but corruption more entrenched. 60% of the population live below the poverty line, 28% of them are employed in the coffee industry – with cheaper land and cheaper labour, coffee is a big growth crop as Honduras seeks to compete with other Central American countries from a low cost base. 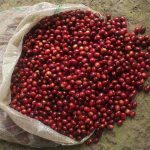 Compared to Guatemala, with an average cost of production of 150c/lb, Honduran coffee is approximately 135c/lb for the same grade. The farmers are mostly small holders, still to a large extent dependent on intermediaries who own the driers to process their crop. Often these intermediaries are the only ones with the means of collecting cherries creating a significant imbalance in negotiating positions. Access to high quality, fair and honourable partners has been difficult for most small holders – the poor infrastructure, lack of information, payment advances required have all meant that most farmers have only survived, and certainly not been incentivised to produce a high quality product. But that is changing and encouragingly the quality can be found. As with Guatemala pricing of coffee is tricky, so much drug money is pouring through the country that intermediaries are washing significant amounts through the purchasing and reselling of lower grade and volume coffees – the unofficial differential exists at around +20 to +40 vs the official diff of +2, this makes it difficult to secure good consistent coffee unless you work directly with producers and develop relationships through working partnerships and loyalty bonuses. We were visiting three producing areas in Honduras, each with its own geography and climate, and each one producing very different coffees. 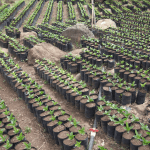 Coffee in Honduras is graded by quality – which is linked to altitude. High Grown (HG) approximates to 80 points or below and is grown between 1000m and 1200m, SHG is 81 to 82 points and grown above 1200m, with a sub classification by defect count and the anything 83+ is classified as specialty. We were met by two representatives from Molinas de Honduras, part of ED&F Man for the trip to La Laguna which is about 2 hours from San Pedro in the Santa Barbara region, on the Western side of Honduras. 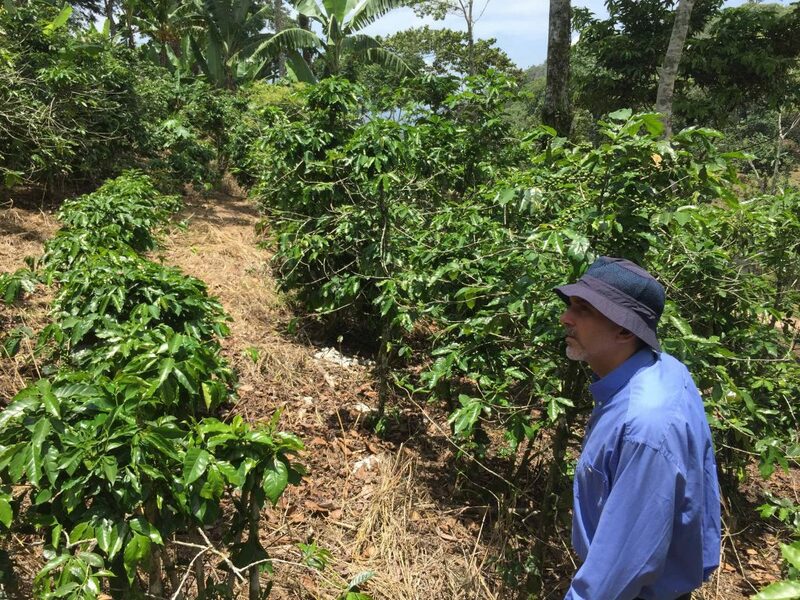 La Laguna is a mill started by Bernardo Rivera Paz, a local coffee farmer in Proteccion and taken over by his eldest son Bernardo Jr. in 2000, who was at that time an attorney. He upgraded the wet mill with better equipment to service the local producers and managed to generate increased prices for them rather than through the traditional middlemen. Tragically, he was kidnapped in 2009 and found dead in Copan despite the ransom being paid. His brother Alfredo Rivera Diaz who is a Doctor, took over the business. Head Roaster Peter Battista on a farm in the La Laguna group engaged in the 3 year pruning rotation program. The core premise of La Laguna is centred around the consolidation and processing of the coffee from the 180 producers in the area. With transport links so poor, the close working relationship between La Laguna, Molinas as the dry mill processor and the producers ensures a larger proportion of the value created goes to the producers. 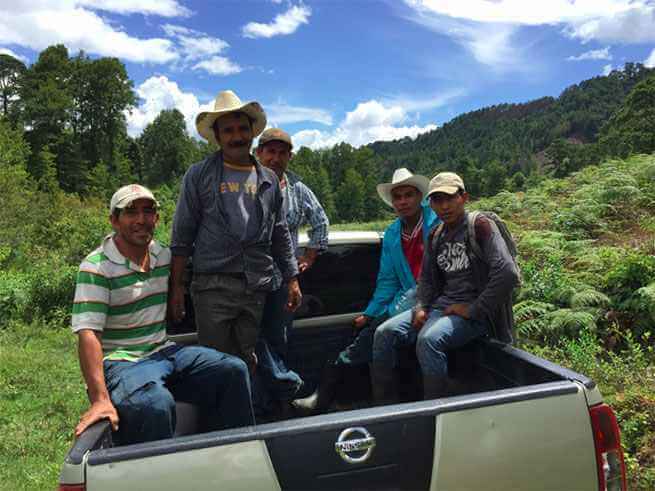 Working with Molinas they are able to train and promote better agronomic practices to increase both quality and yield. Currently La Laguna runs a general store within the community which provides lower cost essentials for the producers. 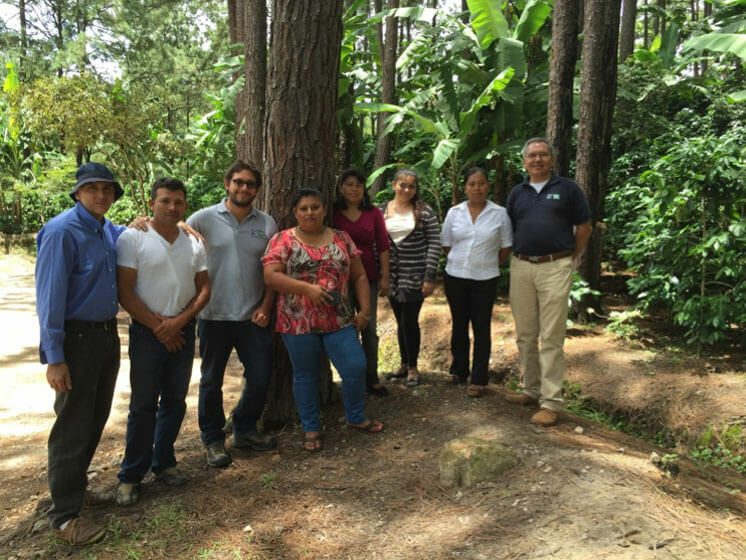 The management team and community influencers in Proteccion are working very closely with Molinas Honduras in a program of education and improved farm practices designed to increase the yield and quality of the coffee produced. 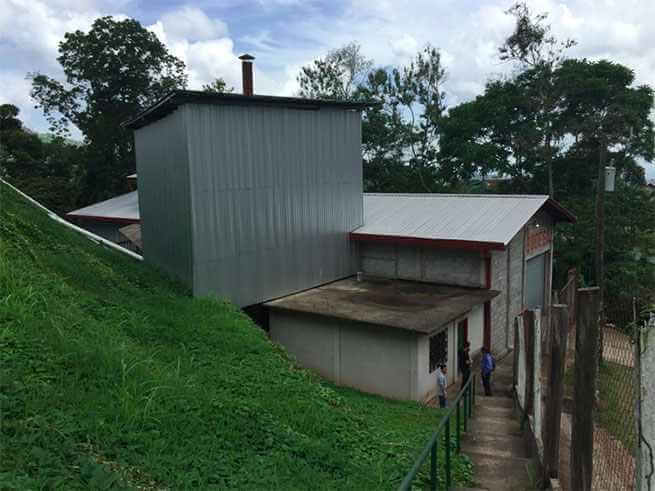 The program at La Laguna continues to build, they now have a full wet mill with vertical drying capacity allowing the community to control quality and sourcing to parchment level. Vertical Drier – la Laguna, Proteccion Santa Barbara, Honduras. 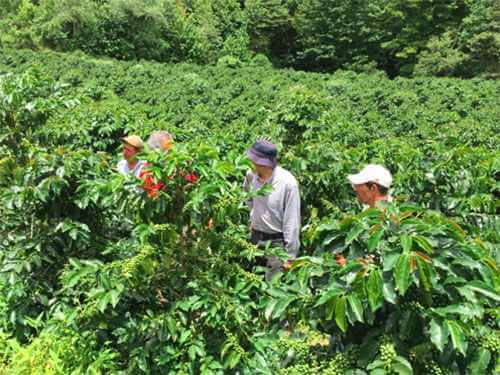 La Laguna is encouraging regeneration of the coffee farms, introducing and championing the “volcafe way” – which involves pruning every 3 years, and regeneration after 20 years. On the following day we visited the small farm holdings in Buenos Aires de Santa Maria close to the small town of Las Botijas to the East of Comayagua in Central Honduras. The dirt and boulder road into the valley is maintained by the villagers, it is their only way to get their cherries out within the timeframe required. Jose and Ramon Mendez are the organisers of the producers in this spectacular location. There are now 36 producers in the group, and another 24 within the area. 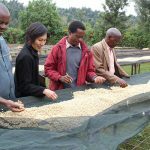 Coffee production began in earnest 4 years ago, the unique micro climate access to water and the altitude make it a high quality producer with potential for steady improvements. 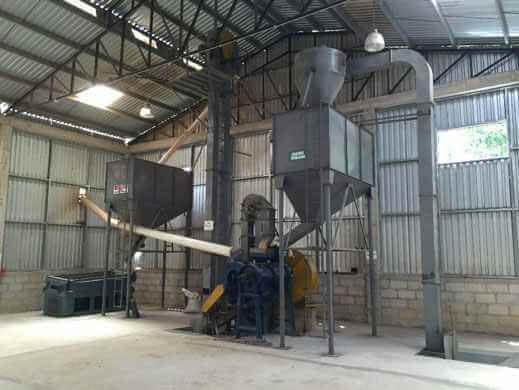 Partnering with Molinas with access to the micro mill and processing plant in Comayagua means Micro lot separation and preparation is now available. 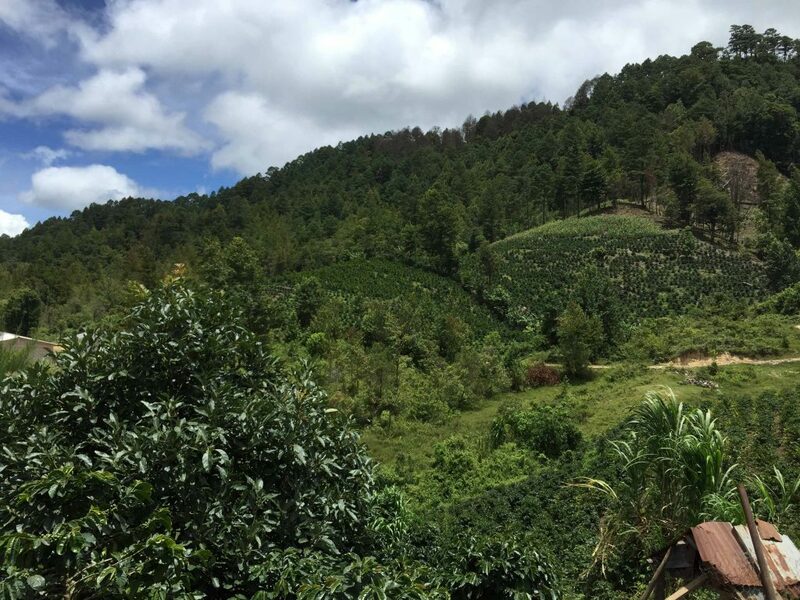 Currently there are 120 Manzanas (about 0.7Ha) given up to coffee in the area, split across the 60 producers, with on average 3000 trees per Manzana. Each tree yields about 1.4kg grams of green coffee, so capacity is currently around 7,300 bags. Each producer produces around 8,500 kg per year. Jose (2nd from left) and Ramon Mendez (3rd from left) with their cousins at Buenos Aires de Santa Maria. Head Roaster with Molinos’ Geraldo Torres at Buenos Aires, in a trial plot of Parainema, a Scimor and Timor Hybrid. Coffee Farm at Buenos Aires. The third region we visited was to the West of Comayagua in the famous coffee region of Marcala, one of the few protected names in Honduras. We were accompanied by Snr Gerardo Torres who did much of the work in creating the Geographic Indicator status for the region and was welcomed like the rock star he is in that area. A quietly spoken but passionate man, Geraldo now works for Milinos in developing the specialty coffees that Honduras is capable of producing. 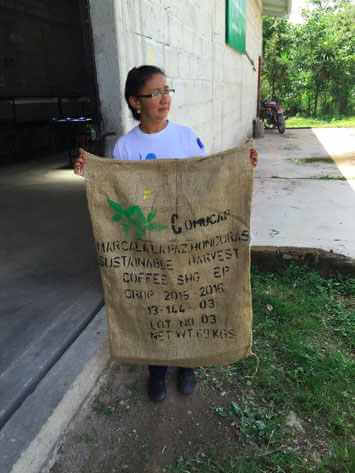 In Marcala we visited Comucap, a Fairtrade and Organic Womens Co-Op which has been running since 1993. Started by 3 women from households where they had suffered domestic violence, they saw economic independence as the only solution in what was then a remote and isolated community. With the slogan or “sempre vivas” – always alive – the group started by running raffles and selling food, before shifting into coffee with the purchase of the first half mansana sized plot “El Mescolito”. The group members now own 52 manzanas. In 2013 there were 286 members and now they have grown to 504. The group has expanded their offering, and now owns and runs their own wet mill, drying beds and now dry mill with vertical drier. All farms involved have to have the female as the head of the family, men are allowed in, but the matriarchal position ensures that the vision of the group is maintained. The focus of the group now is trying to provide opportunities for the youth of the members, many who are finding their way to the cities where they are ending up in jail, in gangs or dead. Wendy Zalaya with the Comucap bag. Peter Battista with the inspiring ladies of Comucap; Suyapa Garcia – President, Mary Helena Lopez, Bandi Montoya and Treasurer Mirian Lopez Maroquin.